Earlier this year I had the distinct pleasure of working with Andy, a 16-year veteran with the Royal Air Force and a real-life fighter pilot. Andy had failed a case interview with one firm but had a confirmed chance with McKinsey London, and he didn’t want to walk away without the offer. With no formal business training, Andy had quite a way to go – but he started with comfort relating to people and was committed to building the skills it would take to nail the case interview. Just got off the phone with McKinsey and have been offered an Associate position!!!!!! I have absolutely no doubt that I couldn’t have done this without you. Thank you so much for working with me over the past few weeks! Andy’s 19-minute story – from his background to how he became interested in consulting to what happened in the interview to how he now plans to transition to greatness in consulting – is worth a watch! It also represents an exciting new moment for us – the first in a series of video interviews we’ll be posting on the site. For those of you without easy access to watch the video, I’ve pasted the transcript below. Jenny Rae: Hi Andy, how are you? Andy: I’m fine, Jenny, how are you? Jenny Rae: Good. Thanks for agreeing to do this informational interview about your experience breaking into consulting. I’m excited to talk to you today. Andy: It’s absolutely my pleasure. It’s the least that I can do. Jenny Rae: So one of the things that I’m going to do before we get started is just lay out an agenda for our call so you and everyone else know where we’re headed, and then we’ll just walk through some of the questions. So basically what I’m going to ask you is about your background and how you became interested in consulting, and then how you discovered our services, and what your experience was like. Then, of course, the thing everybody wants to know is what your experience in the interview was like with McKinsey, and then finally what you’re most excited about from joining the firm. Jenny Rae: First of all, let me just offer my congratulations in person. I’m really excited for you and looking forward to hearing how the story evolved. Andy: Thank you very much. Jenny Rae: Let’s get started. So will you tell us a little bit about your background and how you became interested in consulting? Andy: Well, I’m a fighter pilot in the UK armed forces, and I’ve done sixteen years – I’m just coming to my retirement point at the end of a normal commission and was looking for a new challenge. So one of the things I looked at was consulting and the types of people involved, and the types of work involved, and it was actually very similar to the roles I was doing in the Air Force. And so it seemed like a natural transition. Jenny Rae: So when did the search process start for you? Andy: The search process for me started around May of last year. I decided that I was definitely going to be leaving the Air Force at the end of my contract, and therefore needed something fresh to do. So I literally dove into the website, spoke to friends who are working in the real world just to see what was out there, what kind of things interested me. Jenny Rae: And just for reference, that was almost 12 months ago, so this has been a long, ongoing process for you. Andy: Very much so. And the key in the first part was networking, and getting to speak to people in the right places. The next thing was deciding who I wanted to work for, and then the next stage in that was getting contacts, or networking into those companies. The next process into that was actually getting my CV in the right place to get the interview. The next stage after that was actually doing so well in the interview that they couldn’t resist making me an offer, and that’s where you came in. Jenny Rae: So tell me about that part of the process, from your perspective: what you were thinking, how you first became aware that you needed some assistance with your preparation and what you were looking for. Andy: Absolutely. Well, I realized that because of my work I’m very used to dealing with high-powered people, so I was relatively comfortable with fit or experiential-type interviews. But having never done a case study before, or a case interview, more specifically, before because my background is physics, I’ve got no business acumen or commercial exposure at all. So I actually interviewed with another company, did a case interview, and did very badly. The feedback I got was “we absolutely loved you, your experience was perfect. 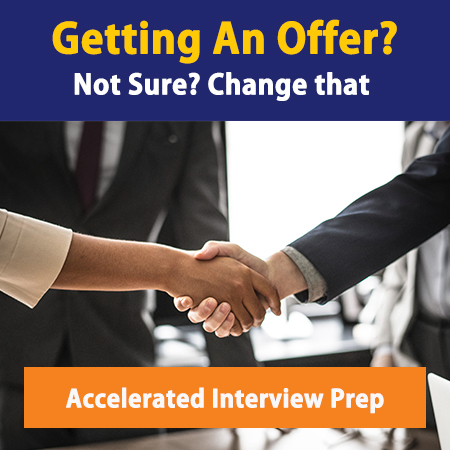 Unfortunately, because you just didn’t get anywhere in your case interview, we just can’t progress you to the next round.” And I self-debriefed and asked some deep questions of myself, and thought, no, you’re absolutely right on this front, and I need help. I need a mini-MBA in three weeks’ time, and I need to learn what the interview is looking for, what kind of questions they’re going to ask, and how to better structure my problem solving. Jenny Rae: How did you find Management Consulted, and me in particular, and why did you decide to work with us? Andy: I scoured the Internet and spoke to friends. Once I’d exhausted the top three companies’ websites, I knew I’d need more help than this. I actually needed some proper coaching. And realistically on the Internet, there are only two real websites that offer any type of coaching that I believed to be credible, but yours, the narrative and the introduction was a lot more personable. So I had a look at the products available, I downloaded the Management Consulted Consulting Interview Bible and a couple of other of the books, had a look through those and really liked what I saw, and did a couple of the self-study cases in there, and thought “this isn’t going to crack it. If I’m going to get this job, the return on investment is nothing as to what I’m going to pay to what I’m going to get paid two, three years down the line with McKinsey,” and from that made the call. Jenny Rae: What was your experience like working with me? Obviously we worked together in preparation for your first round, and then also in between your first and second rounds. Andy: The professionalism was absolutely superb. You’re a pleasure to work with, Jenny Rae. There’s always humor not far from the surface as well, which makes it a lot more comfortable and easy to work with within the scenario. So even though you’re making me work really, really hard, I’m enjoying it at the same time. And at no point do I actually want to leap through the screen and strangle you and say leave me alone, even with the toughest cases. It’s just been really good fun. We worked together leading into the first round, and at McKinsey you do the problem solving test first, and I passed the problem solving test so I knew I was getting the first round of interviews, and I needed to prepare for those. So the key things for me were the interview preparation we did for that was specific to McKinsey and the style of interview I was expecting with McKinsey. What I probably didn’t expect as much was the deep dive questioning in the stop start techniques that were used in those two first round interviews. I must admit it was a Friday afternoon and I walked out of their offices at half past five in the evening absolutely fried. So it was good it was in London so there were plenty of bars available. Andy: After both of those interviews, I got some feedback from McKinsey that said again that the opinion of staff was really, really strong, but I needed just a bit more work on business acumen, all that kind of stuff. The beauty for me is because I was an experienced hire, I wasn’t expected to have the business acumen of an MBA. They do look for different things, and I have discovered that since. But, having got to the second round, I was going to be up in front of partners, and I needed to impress the partners. So on that second piece, in fact, we went for a full ten hours both times purely because I wanted to get a job offer, I didn’t want to muck around going to further interviews. I wasn’t interviewing with anyone else. I made up my mind I wanted to work for McKinsey and I wanted to do everything in my power to ensure I was going to get that offer. So, the second we knew we were going to be interviewing with partners, the introduction of the second McKinsey interviewer, Michael, was absolutely brilliant. He not only answered some McKinsey specific questions I had, but at the start of interview was almost identical to the ones I had witnessed already, and then the ones I witnessed again in the final round. So that was awesome. It was almost like a perfect taper program for an athlete, a runner, or a tri-athlete in that we’d go harder, harder, harder up until I’d seen just about everything I could possibly see, and come away sweating all the way. And then suddenly something clicked, it started getting a lot more straight forward, and then we tapered until the final round. So I went into that final round really, really confident I could crack the cases, I just needed to hold in there for the fit and the experience. Jenny Rae: So tell us what happened in your final round. Andy: The final round was indeed with three partners. Each part of it followed the same kind of format, but as the notes in the Bible says, in your Bible, that is, it’s very much more that they are not confined by structure, they are asking you similar kind of questions, but they’re letting you go on and then they are literally getting the pieces out of that for the fit and experience that they want to get out. It’s not a case of filling in a form and then making a judgment call on it, it’s more or less can I work with this guy, the kind of experiences you’ve gone through, why you think you’re going to be a good McKinsey consultant. Andy: And then again with the cases. Unlike the first round, they were taking cases from their own experience. So in all three interviews they were using work they’d already done, so they knew the answers and they knew the processes they’d gone through, and they were just checking that I was going through those processes as well. Again, it wasn’t a case of getting the right answer. On a couple of occasions we just speared off onto something slightly different, but the partner thought it was interesting to press on my thought process on that just to see how that checked out. So that was very useful as well. Jenny Rae: So what happened after the interview? How long was it until you found out about the offer? Andy: The interviews are in the morning, so they started about 9:00 a.m. and finished about 1:00 p.m. with a bit of a break and similar chance for some food, so I wasn’t starved completely. And then, because I live a good four hours away, I was actually on the train on my way home and just gotten into a station when my phone went, and it was literally three hours after I’d left the building that I got the call. Andy: I was asked if it was a good time to talk, and I said absolutely, but if it goes dead it’s not because I’m hanging up, it’s because I’m probably going through a tunnel on the train. And that was it, it was “Congratulations, we’d like to make you an offer, we’d like to work with you.” I can’t tell you how excited I was to get that call because of all the work we’ve put in, and having gone through and spoken to all the people McKinsey is without doubt the company I wanted to work for. So to have someone really excited about making you an offer to go and work there was fantastic. Jenny Rae: Awesome. One of my favorite things was getting your email that day about the offer. That really made my weekend as well. I get very invested when I’m working with people, especially when we spend 20 hours together. Your success is a big deal to me, so I really appreciated that. Congratulations again. Andy: Thank you. You were actually the second person to find out. I told my wife, and then you got the email straight after that because of all the time and effort you’ve invested. It was worth it. Jenny Rae: That’s great. So now, obviously, you’re starting with McKinsey I think you said in October. Is that right? Jenny Rae: So tell me a little bit about what your plans are in between now and then, and what you’re most excited about for starting. Andy: Between now and then it’s going to be a whole world of change. We’re moving down to just outside London, so we’re moving with the whole family and the dogs, so we’re all going down there. I’ve got a mini-MBA that McKinsey is going to put me through as well, as well as modeling modules and all kinds of other stuff. I’ve also got with the Air Force about seven weeks out of the country doing various trials and bits and pieces with my current role, and to boot about a month after we start with McKinsey we’re now expecting our firstborn as well. So we’ve got the preparations for that to take care of. Jenny Rae: Congratulations all around. Andy: Thank you. It’s going to be a crazy year. It’s been worth it. But the second part of your question, what am I most excited about is the new challenges, and the new projects, working with new people. I actually went in and did an office call on Friday to meet more of the staff and the consultants there. I had some great meetings, and just can’t wait to start doing something different and just moving on with the rest of my life. Jenny Rae: It will open a tremendous number of doors for you as you are moving forward. So that will be really exciting. Andy, looking back on this last year, what recommendations would you give to people that are starting the process like you were about a year ago? Andy: In the first instance, come up with a strategy. Management Consulted has a basic Consulting Roadmap, I think you call it, and the steps in that can help you create a strategy. If you are going to go and work for a strategy consulting company, think about having a strategy before you actually try and join one. So work out, first of all, whether you are going to be attractive to them or not, then make a list of the companies you want to work for. Find out something about them and the people who work there. See if you can network into speaking to people from those companies. Andy: Right at that year ago stage, I wish I’d started doing case interview prep and getting as many studies as I could by starting back then. I’m very much an advocate of working with someone else. It’s all very good and well reading cases and you kind of get bored halfway through a question, and then you just click on to the next one so you get the answer, or you just read ahead because you can’t quite fathom what the question is trying to get. Working with someone, you don’t have that option become you have a person on the other side of the desk, or the other side of the world who has got the answer. So definitely start that at that phase. Andy: And then as you are coming into the interview phase, I highly recommend working with you, Jenny Rae. Work with someone who knows the interview process inside out, knows the kinds of questions you’re going to be asked because it will make such a big difference when you are sitting there in an interview and you get asked one of those questions and you’re trying to fight the wry smile in the corner of your mouth because you know you’ve already got an answer to that question, and you’ve got a good answer to that question. Andy: The feedback I got across the board was all very, very positive, a lot of it was because of the strategy right from day one when I started all the way to getting the offer. I knew what I wanted and I was driven to get it. You just need to make sure you know really want you want to do and that’s been easier for me because I did actually very early on know what I wanted to do. So I only actually applied to two companies. I didn’t go for the standard approach of applying to seven or eight (consulting firms) because I’d already been through interviews in a previous life and I just wanted to focus on the couple of companies that really appealed to me. Jenny Rae: Great. Any final last tidbits or final questions that you have before we sign off? Andy: So if you’re teetering on the brink of should I spend that extra bit of money even though I’ve got this much debt, think about how much you’ll be earning in four or five years time and you can look back at that amount of money and spend it. It does make a real difference. In terms of questions, I’ve had most of them answered now, and I’m a happy man. I’ve got what I want and I’m now just putting everything in place to start a new life, really. Jenny Rae: Well, I look forward to keeping in touch as you start your career at McKinsey, and we’ll look forward to hearing good things from you, Andy, in the next months and years. Andy: Absolutely. Just let me know if there’s anything else I can do to help. Jenny Rae: Will do. I’ll talk to you later. Andy: All right, bye now.